A real food, wine and travel guide for vegan e vegetarian travellers. Viaggia Vegan mixes together the veg offer all over Italy, from north to south. Onlus Food Vibration solved the unpleasant problem for the travellers that follow a cruelty free diet the exhausting research of a place to eat. It has published this brand-new guide with the publisher Del Gallo! 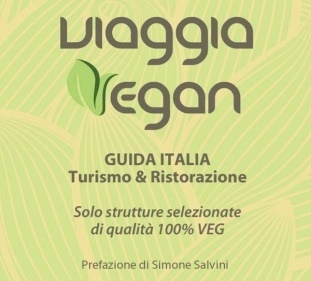 Viaggia Vegan, not only veg but also green, bio and local! There are 130 places all along the Boot from north to south, even if here the offer is still reduced in respect of the region of the north where it is possible to sleep or just eat veg… all of them offer menu, exclusively or in prevalence vegan. There is a particular attention to the ingredients, in particular a great percentage of Bio ingredients, but also the majority of the restaurants are faithful to the vegan choice. Restaurants, delicatessen, agriturismo, B&B, confectioneries… vegan and healthy focused on the healthiest quality. Real point of reference for who travel and can offer great solutions and suggestions for anyone who want to try this particular diet choosing a wide choice of places, careful selected by the most influential vegan! Among them, even the starred chef Simone Salvini, ex chef of the famous Joia in Milan and now it is stable in its restaurant in Rome Ops. Salvini, convinced vegan is specialized in cruelty free food, showing how it is possible to ennoble and taste vegetarian cuisine at high levels, experimenting with preparations, ingredients and pairings. For the first time, these three elements go together, Viaggia Vegan is the Gambero Rosso of the green diet and its aim is to be always updated thanks to the continuous interest towards the vegan philosophy and the opening of restaurants. A guide about travel and food & wine that will become the Bible of who is tired of eating just a salad and cheese served in the major part of the restaurants. In Viaggia Vega you can find a selection dedicated to itineraries and group travels thanks to a specialised tour operators; organized veg holidays is a way to sleep and eat in cruelty free places and they foresees vegan cooking courses!